It’s a well-known fact among food blog consumers that if you want to learn how to make simple Asian, primarily Chinese, dishes, Rasa Malaysia is a go-to place. Back in 2006 when there weren’t as many food blogs as there are now, Bee Yinn Low started her blog as a way of chronicling her attempts to replicate the dishes from her hometown of Penang, Malaysia. The site has grown in leaps and bounds for the past six years, gathering tons of fans, and resulting in Bee’s first cookbook, Easy Chinese Recipes: Family Favorites from Dim Sum to Kung Pao released in late 2011. This recipe for Chinese green onion pancakes can be found in this book along with many other familiar Chinese recipes which you like but perhaps didn’t know are so easy to make. 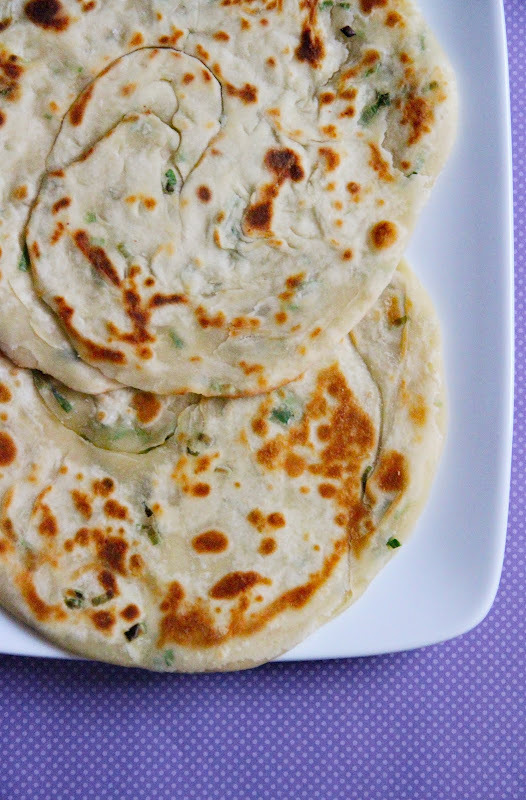 I love the flaky texture of these simple flat breads, the fragrance of the green onions, and the fact that they are delicious both unadorned and paired with other ingredients. I have, in fact, been using these pancakes as satay sandwich wrappers. These are based on my chicken satay sandwich recipe — I just add some green onion slivers (the white parts that are left over), red bell pepper slivers, and thinly-sliced cabbage). I have also enjoy these pancakes spread with a good amount of Nam Prik Pao. Chinese people (and Thai people as well, come to think of it), please forgive me. Sift the flour into a large mixing bowl; add the salt and stir to combine. Boil the water either on the stove top or in a heat-proof bowl in a microwave. Slowly add the water to the flour mixture and carefully (hot water!) knead the dough by hand until the dough is smooth and no longer sticky. This takes about 10 minutes. If more water is needed, add more a little at a time; it’s always better to err on the side of adding too little as you can always add more. Form the dough into a ball, cover with a damp kitchen towel, and let it rest for about 30 minutes. 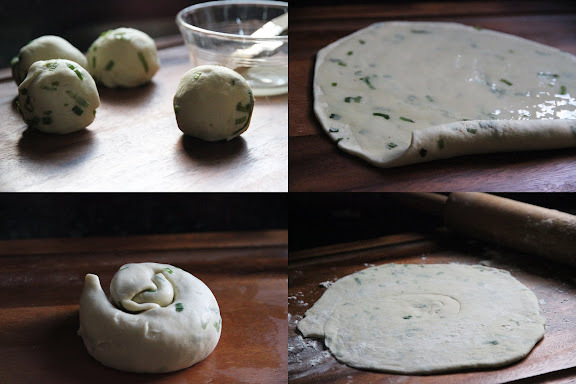 Add the green onion into the dough; mix well. Divide the dough into 8 pieces of equal size; roll each piece into a smooth ball. Working with one dough ball at a time, while keeping the rest covered with a kitchen towel, roll the dough into a thin disc with a rolling pin. Dust the work surface with additional all-purpose flour as needed. Brush the surface of the disc with the vegetable oil. Roll the dough into a pretty tight cylinder — like you do a yoga mat. Dust the rolling pin with additional all-purpose flour and roll the snail out again into a thin disc, measuring about 6 inches in diameter. Repeat the process with the remaining dough balls. Add about 1/4 inch of vegetable oil into a skillet over medium-high heat. Shallow-fry each side of the pancake until it’s golden brown, about one minute. Flip and fry the other side. Add more oil, repeat the same frying process for the remaining pancakes. These pancakes look very tasty and quite lovely, too. I’m enamored with Chinese pancakes and these look amazing. I’m going to try these – thanks so much for sharing! A million times thank you. I’ve been missing this simple yet irreplaceable street food since returning to Canada after a couple of years in China. The frozen versions available here are totally unsatisfactory, and I’ve been wondering what magic went into actually making them at home. Your photo made me almost reach out into my monitor to pull it apart. Sticky, doughy, crispy, salty, onion-y, omg I can’t wait to make it. Thanks Leela! I love Chinese pancakes, I haven’t made them for a while – you’ve inspired me. Leela, thanks for your post. Much appreciated. I actually have a different (and better) recipe for this (but more complicated). The cookbook recipe is simplified and modified to make it easier and more accessible to fit the title “Easy Chinese Recipes.” I have been thinking of sharing my other recipe on Rasa Malaysia. Stay tuned. By the way, love the satay scallion pancake and nam prik pao ideas. For the Chinese, we make them into Chinese burritos with shredded chicken with hoisin sauce spread and tons of cilantro leaves, or shredded beef! Yum. Well, I had to order the book, got the Kindle version, and already browsed a few recipes, the book seems awesome, thanks for the heads up! Your pancakes look fantastic! Can’t wait to try this recipe. Bookmarked! These look delicious and I absolutely love the idea of wrapping them around a satay sandwich. I have a favourite satay recipe, but after reading yours I think I’m going to have to give that a go too! Maya – Ha. Almost, almost. These are flat with flaky layers; they don’t puff up and form pockets like pita. oh i love these pancakes, but i prefer a non hot water dough version. my mom has used the hot water before and it’s good for some things but not this particular item i find it too sticky and soft to my liking. i prefer the crispier version my mom makes! though ill say hot water dough is much easier to kneed and roll out. to each their own…i love your site btw! Such a great recipe. Used it tonight with some leftover teriyaki chicken and sliced raw veggies. My 6 year old daughter has requested them for dinner for the rest of the week.